In a significant development in the ongoing peace talks between government and NDFB, two factions of the militant organisations NDFB (P) and NDFB (R) on Monday sat together for further discussion with Government of India’s interlocutor AB Mathur in New Delhi. Monday’s meeting took place after a long three years gap. 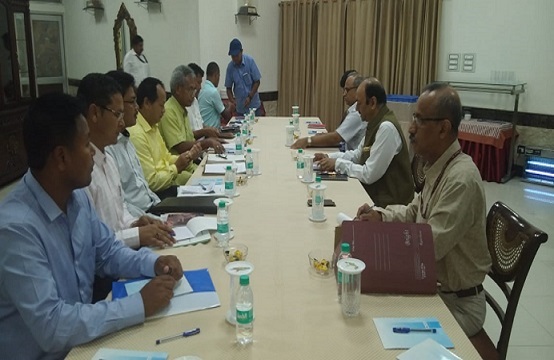 The meeting that took place at North Block mainly centered around NDFB’s charter of demands. All the sides termed the meeting fruitful. “After a long three years gap we set again for the interlocutor level talks. We are happy that we have raised our demands and the government has also listened to our demands carefully…They said they will think over these issues,” G Basumatary, general secretary of NDFB (P) said. Significantly, Government of India’s interlocutor AB Mathur convened this meeting for the first time after taking over the charge as interlocutor. NDFB (R) chief Ranjan Daimary alias DR Nabla led his faction in the talk process. “We are expecting an early solution to our demands. We have submitted 18 points of memorandum from our side and 20 points of demands have been submitted from their (NDFB-P) side. We have discussed point by point issues in today’s meeting,” Ranjan Daimary said reiterating their demand for a separate state. “After several years, we both set together for the first time. It was a historic meeting. The talks were held in a very congenial atmosphere. We have raised our demand for a separate state where we can live with dignity and honour and where we can take our own political decision,” Daimary said. He said that other militant organisations would definitely join in the peace process once they get the result of the ongoing peace talks. Once a dreaded militant leader, Daimary also spoke about the illegal migrant issue. “Because of this illegal migration our identity has been threatened. We have been fighting against the illegal migrants… NRC is a legal document to detect illegal migrants and it has nothing to do with the indigenous people,” Daimary said. From NDFB (P) side its president B Sungthagra, general secretary Gobinda basumatary, assistant general secretary I Damani, judicial secretary Sila Basumatary, publicity secretary S Sanjarng were present in the meeting. NDFB (R) was represented by its chairman Ranjan Daimary, general secretary B Onjalu, assistant general secretary B Dansorang and publicity secretary B Okhahadoi.